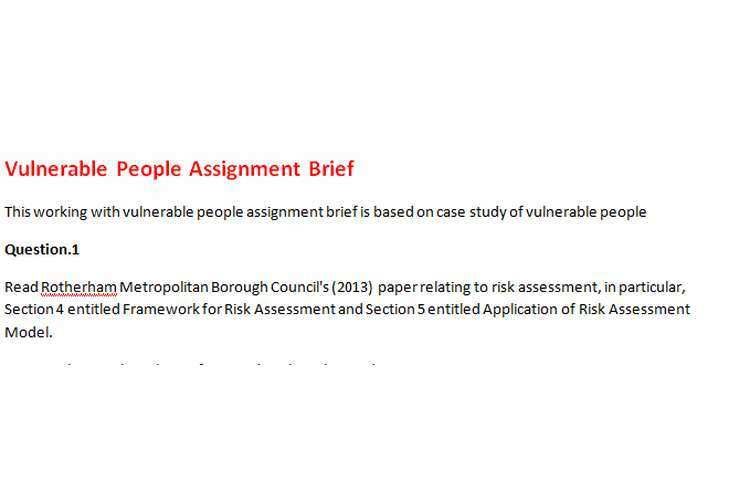 This vulnerable people assignment brief is based on case study of vulnerable people. Read Rotherham Metropolitan Borough Council's (2013) paper relating to risk assessment, in particular, Section 4 entitled Risk Assessment framework and Section 5 entitled Application of Risk Assessment Model. Discuss what you have learnt from undertaking this reading. Please watch the 2-minute video produced by the NSPCC (2016d) entitled Sarah's Story. Having watched Sarah's Story, what is the main message of the video? How can the video help to inform and improve your practice? What strategies could be put in place to mitigate the risk of children and young people being sexually groomed online? What do you think constitutes emotional abuse? Which groups of children do you think would be most at risk of emotional abuse? Which groups of parents do you think would be most likely to emotionally abuse their children? What is the impact on the child? How did you know that the abuse would have that impact? What evidence have you found to support this? Definitions: Explanations for why people abuse children and young people, Legislation: Policies and procedures, Roles and responsibilities, Research Findings. How does the theory explain child abuse? How do the theories differ? Which theory do you think best explains why child abuse occurs, and explain why? Parental responsibility means the legal rights, duties, powers, responsibilities and authority a parent has for a child and the child's property. What responsibilities does a parent have? Should unmarried fathers automatically acquire parental responsibility? Please read the following report that draws attention to a number of potential risk factors relating to particular groups of children, and provides essential information for those who work in schools and other professionals. It highlights the key safeguarding issues, challenges and implications for practice that have emerged from analysis of the SCRs for those working in education and early-years settings and related services. Department for Education (2016) Serious Case Reviews: Triennial analysis of SCRs: Briefing for education practitioners: awareness and understanding [Online]. What were the main risk factors? What implications do the findings have for your own area of practice? What are the strengths and limitations of the research undertaken? What is the sample like? Is it representative? What is its size? Is it a qualitative or quantitative study or is it mixed methods? What do the findings tell you? Use this information in your essay as supporting evidence. Robinson, A. (2011) Risk and intimate partner violence. Chapter 7, pp. 119-138, In: Kemshall, H. & Wilkinson, B. (2011) Good practice in assessing risk: current knowledge, issues, research and approach. London: Jessica Kingsley.